Relax while you take in the sights of Acapulco from the comfort of an air-conditioned van. Visit the Chapel of Peace, watch locals cliff-diving into the Bay of Acapulco and snap photos of a mural painted by Diego Rivera. Experience the city's key attractions and shopping spots including its major avenue and the posh Las Brisas resort. Round-trip hotel and to the Cruise Ship Pier transport is included. During this half-day tour of Acapulco you will visit some of the main landmarks the city has to offer. After pickup at a centrally located meeting point or from your hotel, the first stop on your sightseeing tour is the Chapel of Peace (Capilla de la Paz), a seaside church overlooking gorgeous Acapulco Bay. Follow up with a visit to Las Brisas, a 40-acre (16-hectare) luxury hotel set amid lush gardens with views of the bay. Afterward, your guide takes you to Acapulco's main avenue where you can shop and sip complimentary beverages including margaritas, piña coladas and beer. 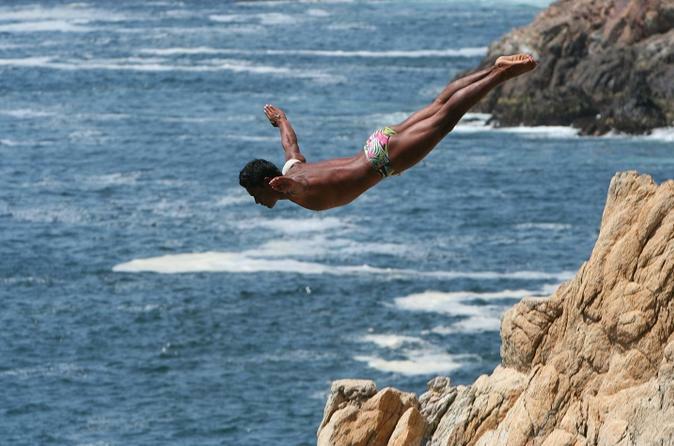 In the afternoon, attend a diving exhibition at the sea cliff called the Quebrada, where cliff divers perform stunning maneuvers into the water. Your guide takes you to see Diego Rivera's famous mosaic mural and makes three additional stops to admire views of the city before your tour ends with hotel drop-off.